The following articles cover the FPB 64 construction sequence. You will find hundreds of detailed photos with explanations covering every phase of the build cycle. Scroll down to the bottom to see the first articles. Details are coming rapidly right now, some of which will be hard to see as the density of installed gear increases. For the gear heads amongst you today’s report will be interesting. Otherwise, the college basketball season is coming to a close, and there are some games to watch. We’ve had some questions on the steering system and this lovely top down view should answer most of them. We’ve got lots of systems and construction details to share, so we hope you are settled in with a beverage close at hand. 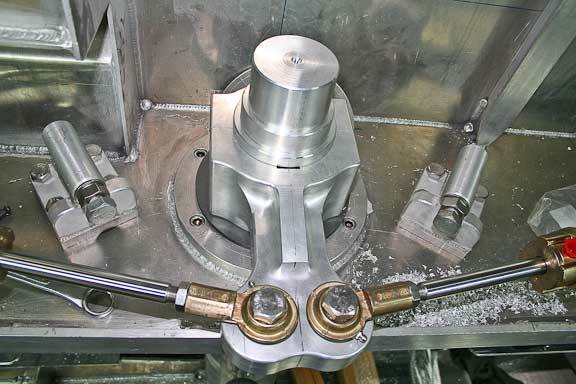 We will start with the steering system, the general arrangement of which is shown above. There are two completely isolated hydraulic and pilot systems, either of which can steer the boat. Getting this right is critical for control in heavy weather. This also needs to be really strong, as the structure has to deal with millions of reverse cycle loading inputs over the years. If you are comparing what follows to your own boat, keep in mind that the FPB 64 is easily controlled, and has a balanced rudder. Early March, and the New Zealand summer is waning. Metalwork on the first FPB 64 is almost complete, and #2 is well along. We have lots of details to show you with this report, so grab a refreshment, and settle in for the tour. 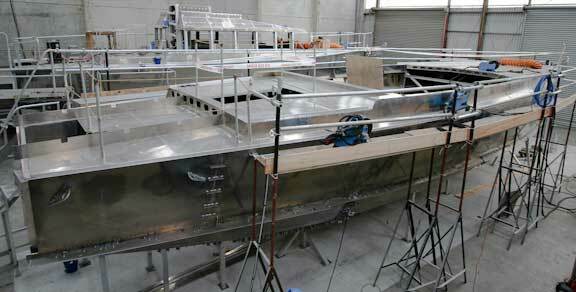 We are almost complete with the metal work on hull number one and hull number two is coming along well. 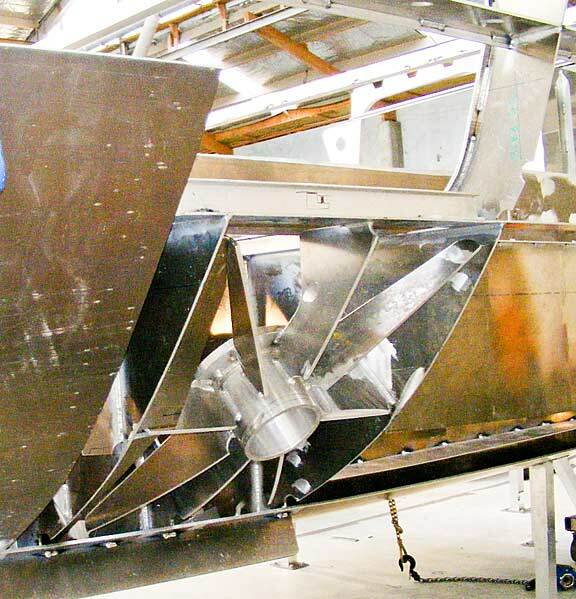 In this update we will start with a critical component to propulsion efficiency and propeller protection – the skeg. Our apologies for being so late with this update. 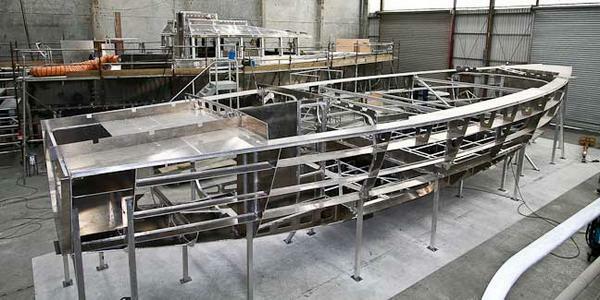 The many requirements of boat building has been keeping us busy. So, there are lots of photos to review (the newest of which is now three weeks old), starting with the one above. The house is now in situ on FPB64 #1 and construction of hull #2 has begun. Since we have been showing you photos of how the FPB 64 is being built, we thought it might be helpful to have a look at how the pieces fit together on a macro basis. 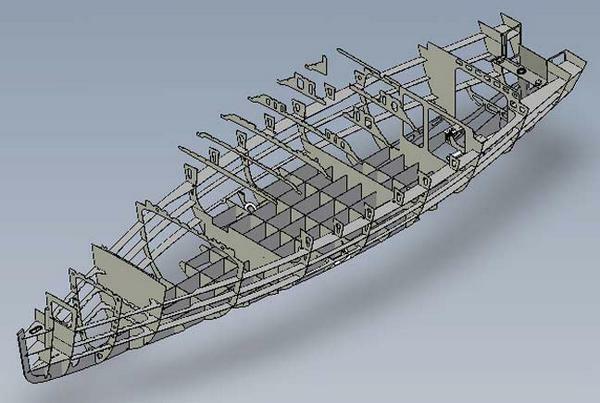 The 3D images above and following are based on the cut files for the FPB 64, from which the boat is actually built. Spring is on its way to New Zealand after a stormy winter, and the first FPB 64 is on its way as well. The second hull is about to start (plate is being cut now). We have been remiss in updating the website, so this is a long, detailed report. We’ll start with this photo of the bow just before it was closed off with the final topside plate. This shows the structure which supports the centerline girder in a collision, forming a watertight tank in the process. Note the vertical solid round bar from the middle horizontal web. This is the Sampson post which exits through deck and is used for towing and other high-load situations. The second bulkhead forms the aft end of the chain locker, and then you have the storage portion of the forepeak. We are often asked why we don’t build the FPBs in fiberglass. We like both fiberglass (properly done) and aluminum, and we have certainly done lots of both over the years. It is just a question of which is best suited to the cruising environment envisaged for this design. Here are a few details to show you why we prefer aluminum for the FPB 64. This is the “boss” into which the stabilizer control structure will be installed. Note the heavy aluminum pipe and gussets, all contained within a watertight coffer dam. There is simply no way you can match the strength of this welded structure with secondary fiberglass bonds. For normal working loads over a brief life span, fiberglass is fine. 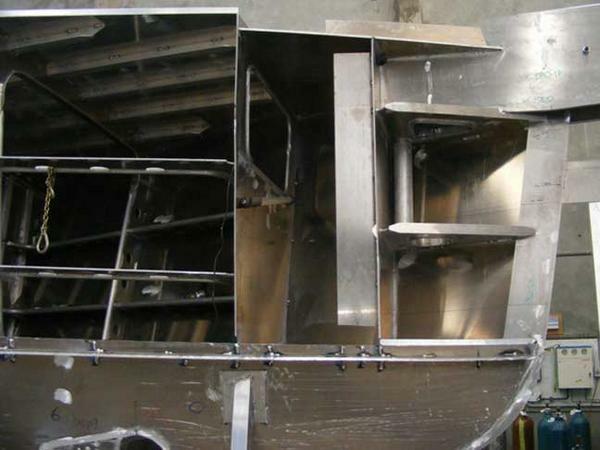 But if you are going to do some rock hopping, dry the boat out on mud flats, and put many thousands of offshore miles on the boat, then we want this highly stressed area to be fabricated from welded aluminum.